I'm not sure I can really call it 'The 2018 Project List', as I'm pretty bad at observing dates with my own to-do lists. It'll be around about that. I was pretty happy with what I managed to get done last year, I think this sort of list helps me get at least a minimum amount of projects complete, and also lets me stop saying to myself over and over again, 'Now what was it I wanted to make next?'. I started this list in early January, honest, Louise you were there! And as it's now April (um...) I have actually finished some of the items on the list already. Which is a good thing, because summer and I don't get on, the heat makes me very unproductive. 1. Teahouse wrap, using the Elenna yarn I bought from Spotlight. I had bought this yarn to do a c2c aztec inspired graphic cushion, but my enthusiasm for that idea evaporated. Maybe because I just don't want mustard in the living room? I'm still keen to have a crack at a c2c project. FINISHED! 2. Whirl shawl/wrap/cowl thing! I impulse purchased a Scheepjes whirl, because why wouldn't you, and now I need to find a project for it, or make up a pattern, because after 3 triangular shawls I need to do something different this time. Pattern in the works! 3. A simple tote bag using the WATG Mixtape that my yarn fairy godmother found and sent to me. 4. Hotel of Bees shawl. Yes. Hmm. I do love it, but this is sort of low priority. Plus I don't have the yarn for it yet. 5. Black granny cocoon cardigan. I've been picturing this one for quite a while now, I even know which yarn I want to use, it's a Katia cotton merino blend. I know! What?! Wool?! Yep, I tried on the sample knit in Sew and Tell in Berry and it didn't itch, so I'm going for it. I think it'll be only for the coolest of days though. 6. 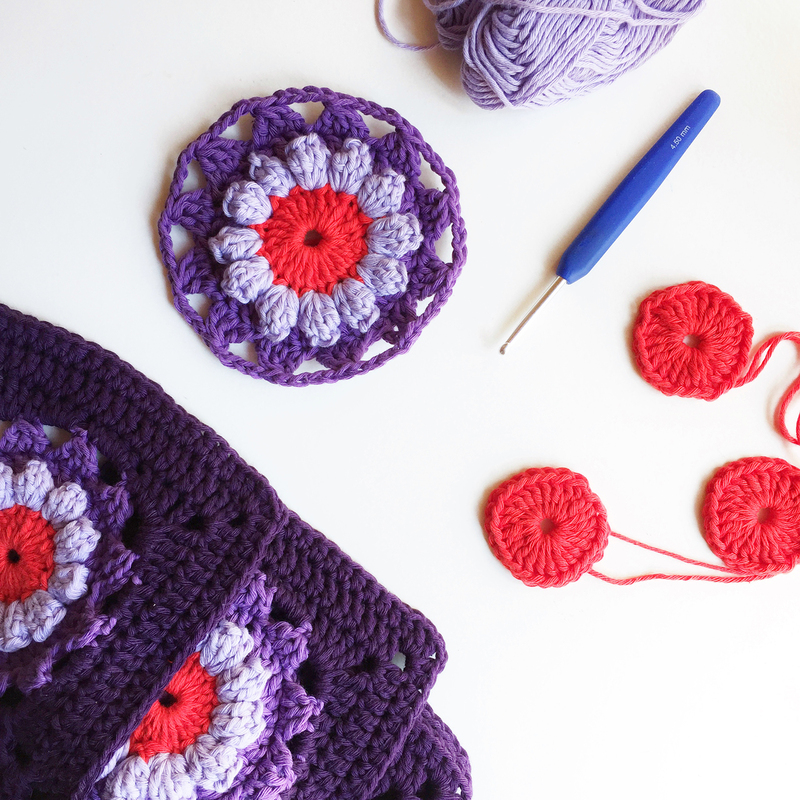 Pull apart my granny square tee and redo. Turns out square tops aren't the right proportion for me. I'm looking forward to coming up with my own design for this one. He's chosen the bottom right one, with the puffy dot centre. 7. Green hexie blanket for youngest. I'll have to check in with him before actual yarn purchasing in case he's changed his mind again. I really want to do this one, but need to buy yarn. Probably Paintbox cotton aran so I can get the right shade of green. 8. In the midnight garden blanket - this is a WIP from last year, it's due for xmas 2018, which does seem ages away but time flies so I need to get a move on with this! 9. Black beanie for eldest - need to buy yarn, but have a plan for that. It'll be WATG Shiny Happy Cotton in black, should only need one ball. 10. Space invaders cushion for eldest bed. 11. Bag with the round handles a friend gave me. Still sorting out what pattern to go for with this one. 12. 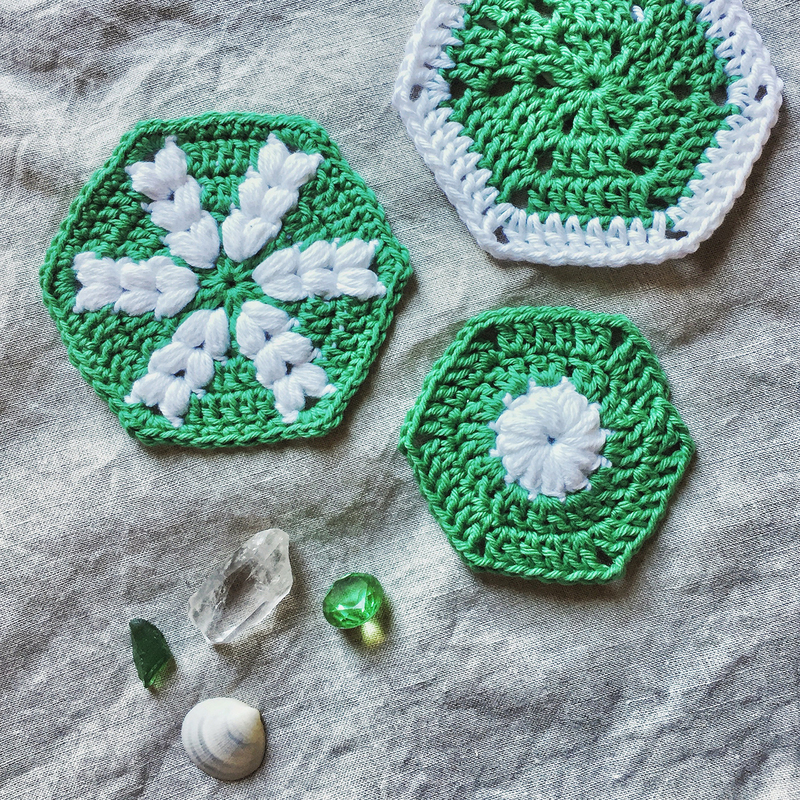 I really want to do a mini granny blanket, neon centres and black. It's bugging me. 13. 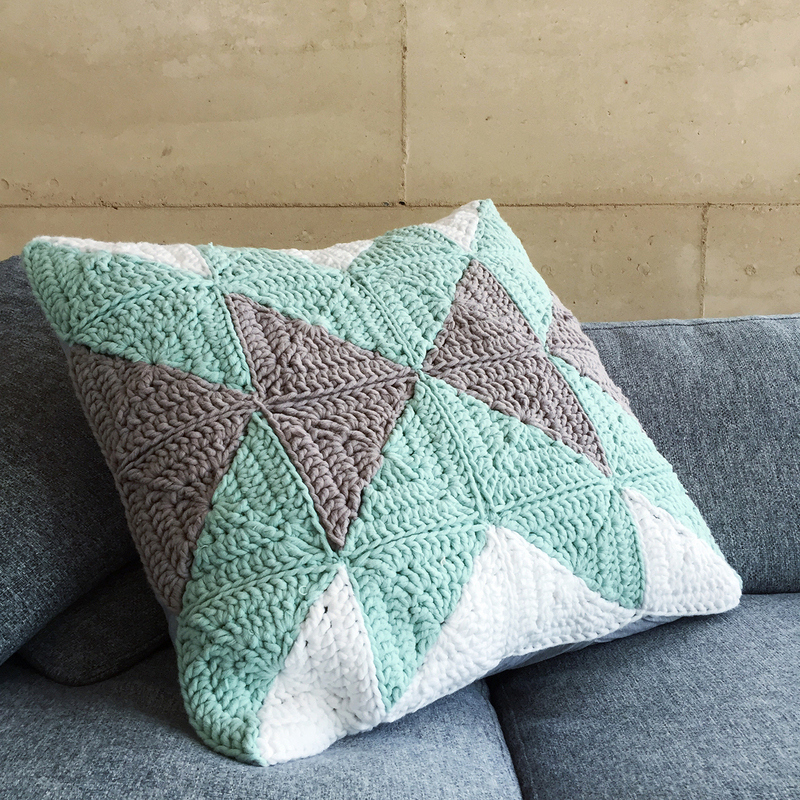 Finish the two tone squares cushion front. Aargh! I don't want 13 in the list so what else can I add... FINISHED! 14. Sofa throw - this is for someone else, it'll be chunky, but might not be chunky yarn as such, maybe multiple threads held together, because it needs to be cotton. I'm thinking French Navy Bendigo Woollen Mills cotton for this one. Things for the school fete handmade stall. The problem with any list is as soon as you get it down it starts to morph, it's already taken so long to write this down that it changed in the writing!